Derrick Rose not only said he wasn’t depressed about his latest injury setback, but he wanted to know who even said he was. He didn’t say anything about disliking the Bulls’ rebuilding plans going forward, which was suggested in anonymous reports a few months back. He didn’t seem upset about the Luol Deng trade, said he wasn’t really even thinking about the possibility of a return this season because he’s so focused on his rehabilitation and isn’t even able to run yet. He said he feels terrific, but he hardly sounded like someone who planned to play any basketball before the USA camp this summer. “For sure, if my leg is feeling healthy I’m all in,” Rose said about the USA Basketball invite for this summer’s pre World Cup tournament. ”Of course I want to play for that team. Playing for that team, I think, helped the year I won MVP, just getting in a groove. I’m excited if I am able to play in it. “I haven’t even had a chance to think about it, to tell you truth,” Rose said about holding open the possibility of a return this season or in the playoffs. “I’m just worrying about my next stage in this process and that’s running. Right now I’m not. I’m on the Alter G (anti gravity treadmill) right now, running on that and hopefully I’ll be running without it pretty soon. Rose made his first public comments in more than two months at the Bulls annual charity gala at the United Center Wednesday evening. Rose made his first public comments in more than two months at the Bulls annual charity gala at the United Center Wednesday evening. Dressed sharply in grey suit and matching tie with purple shirt, Rose spoke for about three minutes to local reporters. He seemed comfortable and relaxed, similar to how he’s been around the team since he began traveling about a month ago. Unlike last season, there’s no countdown and guessing toward playing since the team said Rose would be out this season. Bulls coach Tom Thibodeau this week reiterated that Rose was not likely to practice with the team this regular season, which would certainly eliminate any playing. Rose had seemed to keep the possibility open of playing in his only media appearance, Dec. 6, after his Nov. 22 knee injury in Portland. He said then if he were healthy and the situation were right he’d be back playing. But Rose Wednesday seemed to make clear that no longer was a possibility and that perhaps it was misunderstood back then. “I’m feeling good, feels normal,” Rose said, sounding upbeat and positive. “Just trying to take it one day at a time and trying to stay positive. It (injured knee) feels normal. It’s an easier (rehabilitation) process for sure (from a torn meniscus rather than an ACL in the 2012-13 season). I’m able to walk. It feels normal right now, but I know I’m not there. Rose said he contacted Deng, texted Deng and friends of Deng and said he has fond memories of Deng back to when he enjoyed watching him while Rose was a high school player in Chicago. 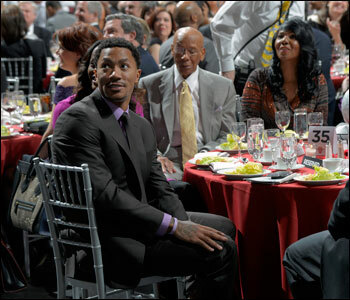 But Rose said he also understood the business nature of the sport. Rose said he really, really isn’t thinking about next season and any plans for the team. He said he’s just completely focused on his rehabilitation, which is the best thing he can do for the team. Rose only seemed taken aback when it was suggested he’d been depressed. “Who said I was down?” Rose shot back.